TV show dates: January 2, 2018 — May 1, 2018. Performers include: Dylan McDermott, Kim Matula, Ed Weeks, Nathan Lee Graham, Olivia Macklin, Peter Stormare, and Amir Talai. 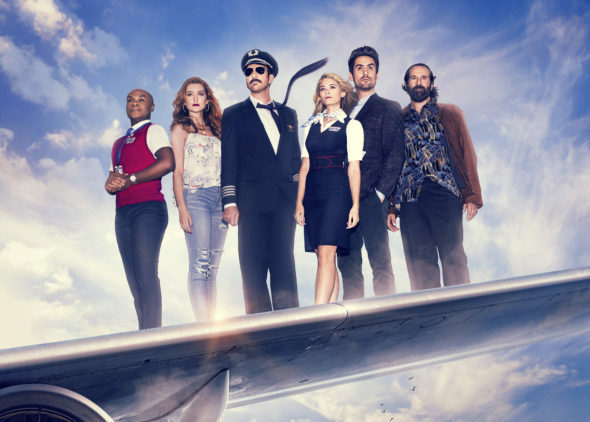 From creator Lon Zimmet, the LA to Vegas TV show centers on the weekly Jackpot Airlines roundtrip flight from Los Angeles to Las Vegas. The workplace comedy follows the crew and frequent fliers who make the regular weekend trek to the Sin City, with dreams of returning a big winner. Captain Dave (McDermott) is always joking about drinking and getting high before flights. Or is he? He’s not above complaining about getting “cockpit” blocked and seems to think having fun with the passengers is his job number one. He’s also inclined to tease his naïve co-pilot, Alan (Talai). Flight attendant Ronnie (Matula) is on top of everything up in the air — from keeping the passengers in check, to grounding her flighty crew mates. When she’s back home, on terra firma, her life is more or less a hot mess. Meanwhile, senior flight attendant Bernard (Graham), is certain he knows it all. He certainly seems to know everything about everyone, like when Ronnie doesn’t get dressed until she’s in the terminal. Jackpot regular Colin (Weeks) is an economics professor, who makes the weekly pilgrimage to Vegas, in an effort to reconnect with his son. The growing attraction he and Ronnie feel for one another might just prove the wrench in his pans. Then there’s Artem (Stormare) and Nichole (Macklin). They’re regulars on the flight for one reason: money. While Artem’s a superstitious, professional gambler, Nichole’s an exotic dancer, who makes reliable bank in what is the City of Lost Wages, for most. As this oddball crew and their kooky passengers spend more time together, they bond into a sort of temporary chosen family — at least on the weekends. After that, all bets are off. Ronnie applies for a job on another airline, not thinking about what a change in route might mean for her relationship with Bryan. Meanwhile, Captain Dave plans to propose to Patricia, against Nichole’s wishes, and Artem encourages Colin to stand up to his ex-wife. First aired: May 1, 2018. What do you think? Do you like the LA to Vegas TV series? Should this TV show have been cancelled or renewed for a second season on FOX? Loved the show – hate it was cancelled— kind of silly but don’t we need that every now and then?? This show was just “unique”. Absolutely loved it and looked forward every week to watch it.